We’re abused yet cherished, thrown and caught, bit and squeaked. We’ve had surgeries, endured slobber, and are intimately familiar with doggie breath. We’re laid on, squashed, and sometimes mangled. 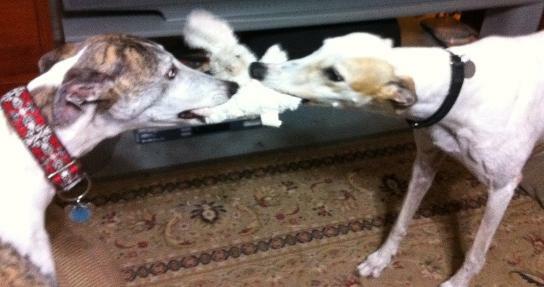 We are the toys of greyhounds. We are survivors: conquerors of the washing machine and needles with thread. We’ve lost ears, eyes, squeakers, legs, and stuffing yet we still carry on. Despite the tragic abuse, we love our job. 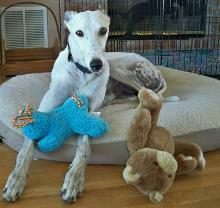 We teach scared greys to let loose and wag their tail. We are a reward for a job well done and a security blanket in a moment of fear. We squeak, squawk, honk, crackle, and pop- all in the name of play. We understand that our services are often exploited, used to attract the looks and affections of humans with incessant squeaking. These moments are often accompanied by a wagging tail and a rear in the air. We’re okay with that because we love our job. So remember us: the cows, teddies, and pigs; snakes, raccoons, and mice; the furry inanimate objects that litter your home and often smell bad. Remember that we are your grey’s best friend and your source of entertainment. Because, we not only help provide a happy life for your grey…we put a smile on your face too. 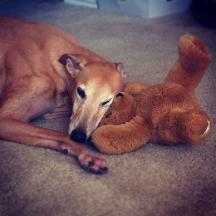 Jazz with his Teddy Bear.